The decision on 25 September 2015 by the 193 member states of the UN to endorse, support and promote a global program to eradicate world poverty was nothing short of momentous. The 17 goals with their respective targets and indicators were laid out in the document Transforming Our World: the 2030 Agenda for Sustainable Development. Unlike the Millennium Development Goals, which were pitched at developing nations, the Sustainable Development Goals (SDGs) are universal, integrated and committed to “leave no-one behind”. While developed countries still have an important obligation to support developing countries, particularly in their region, they are not immune from scrutiny through the SDG lens. All the goals have a set of targets, or milestones, to be met on the way to 2030, and these targets have one or two indicators which allow for measuring progress. Along with these measuring processes, each country is invited to present to the United Nations General Assembly its progress on a chosen number of the goals. Called the Voluntary National Review, this is an opportunity for countries to be scrutinised as to their implementation of the goals and serves as a basis for an international review of the progress of the SDGs. Sustainable Development Goals (9515). IAEA Imagebank. flickr cc. This year, Australia and a number of other countries will be reporting on the theme, Transformation towards sustainable and resilient societies, with specific focus on water and sanitation (Goal 6), affordable, sustainable energy (Goal 7), safe, resilient cities (Goal 11), sustainable consumption and production (Goal 12), sustainable ecosystems, biodiversity, land and forest management (Goal 15), and the underpinning goal of developing partnerships (Goal 17). It is regrettable that there has been little discussion in Australia about our progress on these goals. The prospect of the Voluntary National Review has engendered a flurry of activity in the Department of Foreign Affairs and Trade (DFAT), as it works with various government departments to hold consultations and invite submissions on the progress of the specified goals. But government activity is not enough, if Australia is to make progress on the SDGs. 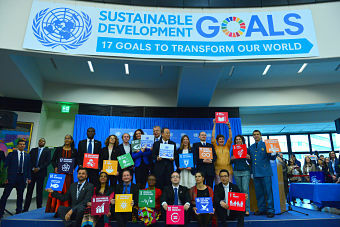 Five agencies, the Australian Council for International Development (ACFID), ACOSS, Global Compact Network, Sustainable Development Solutions Network (SDSN) Australia Pacific, and United Nations Association of Australia (UNAA), have hosted two SDG summits, bringing together all levels of government, the private sector, non-government organisations, and civil society. The summits aimed to unlock the opportunities of the SDGs by taking stock of national progress on implementation across all sectors, and mapping priorities, areas for cooperation, and steps for driving achievement forward. The recent summit in Melbourne on 13 March was facilitated by Ms Sam Mostyn, who has considerable experience in government departments, has sat on numerous boards, and is involved in a number of not-for-profit organisations, and Professor John Thwaites, former Deputy Premier of Victoria and now a member of the Monash University Sustainable Development Institute and Chair of ClimateWorks Australia. Under their excellent facilitation, summit participants heard from Senator Fieravanti-Wells, the Minister for International Development and the Pacific, Mark Dreyfus, Shadow Attorney General, speakers from local councils, the building industry, the sponsoring agencies, Australia Post, the Superannuation Funds, and many others. In essence, they had much progress to report on, particularly when it came to programs in the Pacific, where Australia is engaged in the education of women and girls, the collection of data, weather early-warning systems, climate change mitigation, and much else. While the mood was generally positive, there was a sense of urgency when faced with the fact that Australia is 20th on the list of nations making progress. Given our affluence, our established bureaucracies, and high standard of living, we should be among the top ten. The major problem for Australia is that the “universal, integrated, and ‘leave no one behind’” component of the SDGs is obscured by our emphasis on overseas aid. No-one is arguing that we should not be doing everything we can for developing countries, but if the Department of Foreign Affairs and Trade is the lead agency, then the focus of work for the SDGs is on aid and development in Asia-Pacific, and minimum attention is paid to what is happening in Australia. 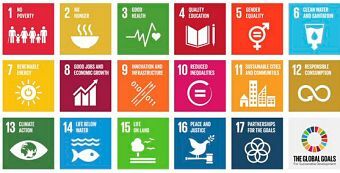 Why downplay the SDGs, which are so critical for Australia? Sustainable Development Goals. Alan Parkinson. flickr cc. Indeed, most Australians know little or nothing about the SDGs; even the Minister stated “many do not understand the SDGs, why we have them and what they are for”. The President of UNAA, Major-General Michael Smith, was harsh in his criticism of the SDG process in Australia saying “people don’t know about the SDGs, they think they are just for poor people”. He then went on to note that there is no PR campaign for the SDGs, no national plan, and no SDG champions. UNAA has written to all politicians, asking that the SDGs be embedded in all government policies. In a similar vein, Marc Purcell, the CEO of ACFID, urged government to model the implementation of the SDGs at home and have a national plan, while Sharon Smee from the International Women’s Development Agency argued for gender equality and a recognition of the SDGs across all policies. Catherine Hunter from KPMG spoke of the importance of the SDGs for business, and how much of the business community is already aligned with the SDGs. She urged the government to communicate the impact of the SDGs on the many challenging development issues. Susan Mizrah, from Australia Post raised the importance of small business in the implementation of the SDGs, and the impossibility of achieving the targets unless small business is “on board”. But it was Cassandra Goldie, CEO of ACOSS, and Gary Oliver from the National Congress of First Peoples who put the SDGs firmly in the Australian context, raising issues of social protection, the unpredictable employment climate, housing affordability, the life expectancy of Indigenous people, and the 17,600 homeless children. And it was Ms Goldie who noted that we are doing nothing to communicate the SDGs to our multi-cultural society. Many other speakers, and the reports from the afternoon’s breakout groups, urged the participants to remember to “leave no one behind”, and to begin with those furthest behind, particularly Indigenous Australians, those with disabilities, and women. Gender discrimination is still alive and well in Australia, with a gap in rates of male and female pay, female labour casualised, and the need for much increased female representation in leadership. The summit ended with a speech from Mark Dreyfus, Shadow Attorney-General, who described the SDGs as a “compelling framework”, universal in their application and pitched to the needs of each country. He called attention to Australia’s “patchy progress” when it comes to Indigenous people, the integration of those with disabilities, the support of minorities, and homelessness. He highlighted the prevalence of violence globally, as well as locally, to the voices of women and to the rule and role of law. By recognising the interconnectedness of the law, development and human rights, peace and security might prevail. The day ended with John Thwaites arguing that achieving the SDGs is possible, but not by “business as usual”. Given the complexity of the SDGs, he urged increased collaboration, increased funding, increased innovation, and the inclusion of young people in the process. Arrangements were made for increased data collection, and plans were forecast for processes to be put in place to assist organisations work together. It remains to be seen whether the government will see fit to develop a process for engaging the general public. Sister Libby Rogerson IBVM is a Loreto sister, currently working with Mary Ward International Australia, the Loreto Sisters’ aid, development, and volunteer organisation. From 1999 to 2009, Sr Libby was coordinator of Social Justice and Director of Caritas in the Diocese of Parramatta. 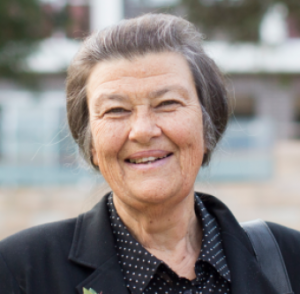 She is a member of the CLRI NSW Justice Committee, board member of Jesuit Social Services, deputy chair Loreto Normanhurst School Council, member of Catholic Social Services Centacare (Parramatta), and a member of the Loreto Sisters JPIC Committee. From 1993 to 1998, Sr Libby served on the General Council of the Loreto Sisters, based in Rome, and visiting Loreto sisters in 14 countries. In 1999, Sr Libby worked with Caritas in East Timor, and was awarded the Humanitarian medal for her services. As a former member of the Caritas Australia National Council and Chair of the Loreto Sisters Justice Committee, Sr Libby has in recent years visited projects in Bougainville, Tonga, Vietnam, Southern Africa, and Kenya. On 21 March 2018 Sr Libby Rogerson made a Submission on the United Nations Sustainable Development Goals 2018 on behalf of Mary Ward International to Foreign Affairs, Defence and Trade Committee, Department of the Senate of the Australian Parliament.